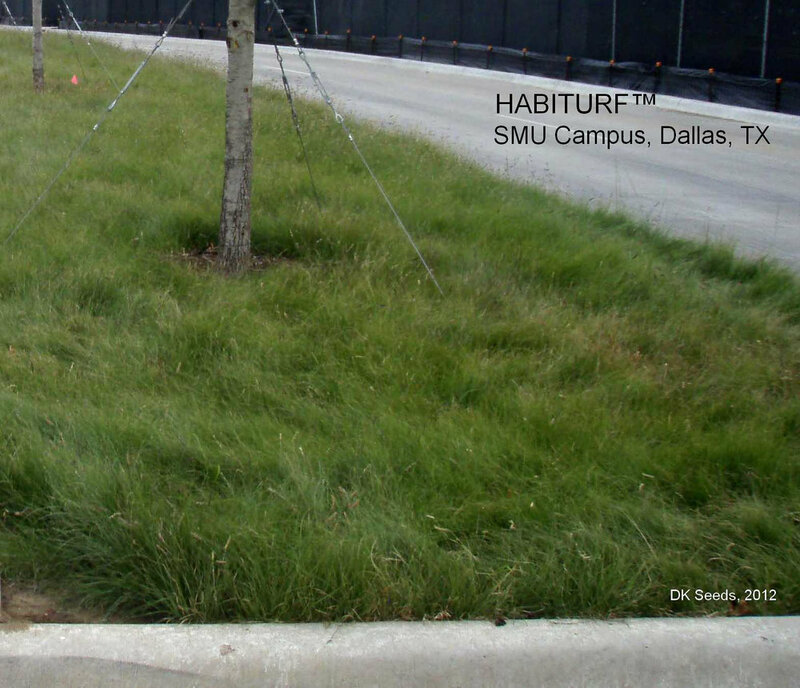 Developed by the Lady Bird Johnson Wildflower Center, Habiturf simulates shortgrass prairies. Yet, Habiturf provides all the visual beauty of a uniform lawn with the drought-tolerance and low maintenance of native Texas grasses. Heartiness is achieved through the use of multiple species, but the uniformity of the leaves and color make for a lush, beautiful lawn. Habiturf has been observed to outperform Bermudagrass in terms of establishment rates, turf thickness, mowing rates, and weed resistance. We recommend not mowing at all, but if you want to mow it should be mowed every 3 to 5 weeks (when growing) at a height of 4 inches. This mix requires less water than traditional lawn grasses, reasonable resistance to foot traffic, and little to no herbicide application or fertilization. Habiturf does best when planted in two times of the year. In the spring, after the last frost; and in the fall, two months before the first frost. Depending on where you live and when the frost comes and goes will determine the best planting time. Feel free to contact us on advice for the best planting time for your area. We do not recommend planting once the temperatures have begun to drop below 65 at night. A portion of all Habiturf sales will be donated to the Lady Bird Johnson Wildflower Center. When to plant: Habiturf does best when planted in two times of the year. Depending on where you live and when the frost comes and goes will determine the best planting time. Planting Rate: Plant at a rate of 5 lbs./1000 sq. ft.
How to Plant: Cultivate soil to at least 8 inches, then incorporate .5 inches of living compost with low nitrogen and low phosphorus into the top 3 inches. Sow seed, rake and press. Irrigate each day for the first 10 days, then twice weekly for the next 2 months, then twice monthly. Light requirements: Habiturf needs at least 6-8 hours full sun. It does not grow well in shade. Height: Habiturf will grow to about 6 inches if left alone - which is recommended for best look. If you want to mow it, mow at the highest setting 1-2 times per month during the growing season (March - September). The higher you leave the grass, the more drought tolerant it will be and will require less watering. To see what it looks like, take a look at some of our customers photos.